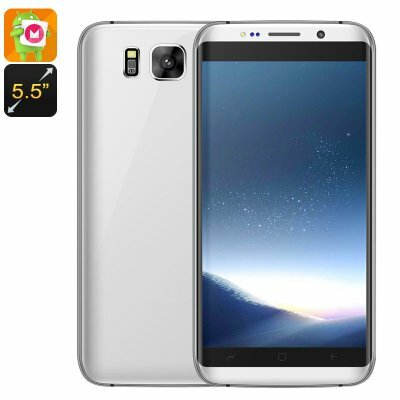 Successfully Added E-Ceros C8 Edge Smartphone - Quad-Core CPU, 3G, Dual-IMEI, Android 6.0, 5.5-Inch Display, Google Play, Bluetooth 4.0 (Silver) to your Shopping Cart. If you’re looking for an affordable Android phone that meets all your basic smartphone needs, the E-Ceros C8 Edge is perfect for you. Thanks to its low price tag, this Android phone is great for first-time smartphone users or to be simply used as a backup phone. The E-Ceros C8 features Dual-IMEI numbers. Thanks to this, you’ll be able to slide in two SIM cards and stay connected to both at once. You are furthermore treated to 3G and WiFi connectivity. Therefore, you can be assured that this cheap Android phone keeps you connected at any time. Packed within its sleek body, you’ll find a sophisticated Quad-Core processor that has been clocked at 1.3GHz. Along with 1GB RAM, this CPU allows you to tackle all basic Apps and software features available. With its Android 6.0 operating system, this cheap smartphone treats you to a smooth user experience at all times. You’ll be able to play basic games, watch movies, and browse the web. Not a single of your basic needs is too much for this Android phone. On its 5.5-Inch display, it is sure to treat you to beautiful visuals while enjoying your favorite media. A powerful 2300mah battery brings along up to 6 hours of usage time. Thanks to this, you’ll be able to get through the longest of days without needing to worry about battery life. With the phone’s 8GB ROM and 32GB external memory support, this Android smartphone offers plenty of space to keep your files and media. The Android phone even comes with a sophisticated 5MP camera that lets you shoot HD videos and beautiful pictures of all those special moments in life. The E-Ceros C8 Edge Android Phone comes with a 12 months warranty, brought to you by the leader in electronic devices as well as wholesale smartphones..